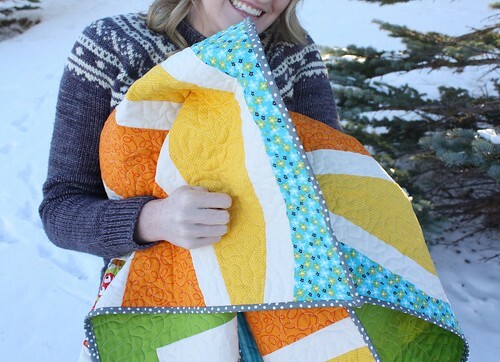 Two years ago, when I had only just started quilting, I fell for Elizabeth Hartman's blog, Oh Fransson!, followed quickly by my love of her New Wave Quilt pattern. As a novice quilter with only three other quilts under my belt, I thought this was a good next step. This quilt marked my first foray into quilting with a more modern design, and was the first time I ever tried free motion quilting. 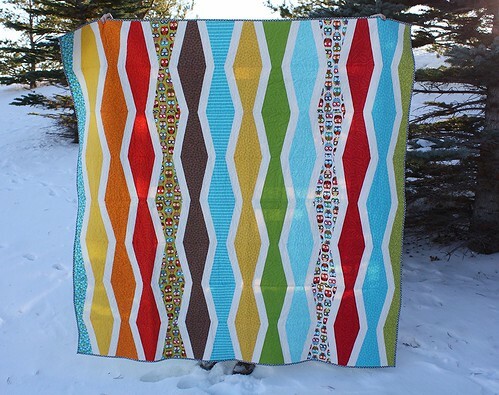 Simultaneously, it also happened to be the first time I had ever ordered fabric online (Fat Quarter Shop to be exact!). While I'm not traditionally a crayola colour scheme kind of lady, I feel hard for the little owl prints! I think this is a timeless treasures line, thought the name escapes me. The bundle I purchased came with a panel featuring various forest scenes, so I fussy cut them, framed them in gray and white, and then used them on the back. This poor quilt has been sitting neglected in my fabric wardrobe for a few years, and recently had a wee run in with a metal drawer slide. After trimming down the bottom of the quilt to cut off the hole, I debated cutting some off the top as well to recenter the quilt back. 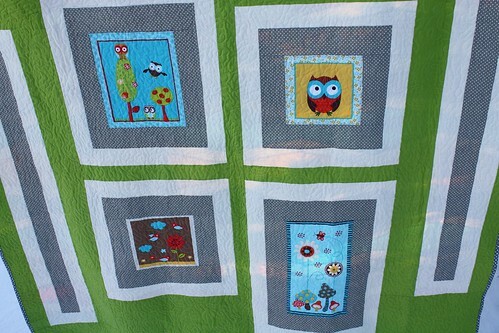 In the end I decided the future recipient (who is 3 and ADORES both owls and the colour green) won't mind the back one bit so I left it as large as possible. 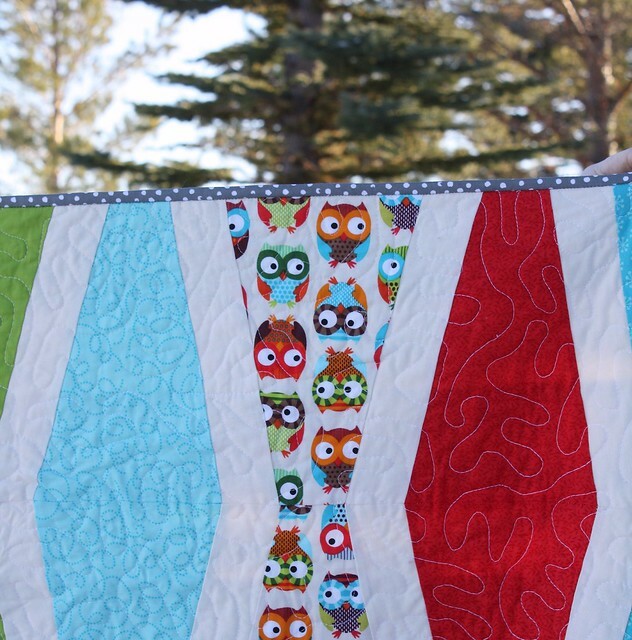 It's fun to look back at a quilt that challenged me in so many ways, but also really opened my eyes to a whole new world of modern quilting. 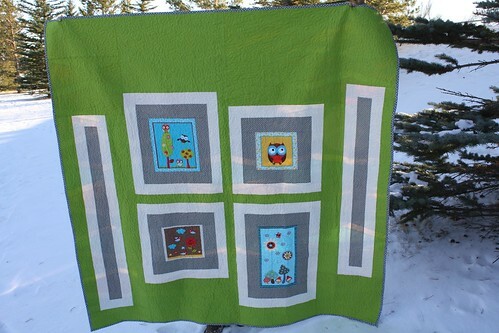 While my colour palette has matured over the years, and my FMQ has improved, it gives me a lot of joy to pull this quilt out from storage, and to gift it to someone I know will love it.